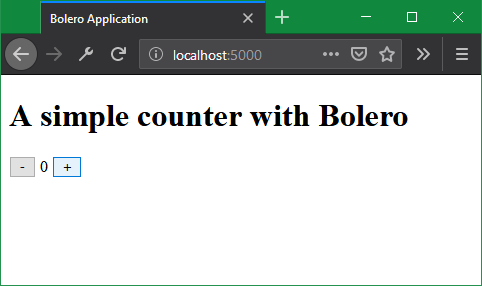 Welcome to Bolero: F# on WebAssembly! Bolero is a set of free and open-source libraries and tools to write WebAssembly applications in F#. With it, you can write fully dynamic client-side web applications from the comfort of a strongly-typed functional language, all with great performance. Elmish Model-View-Update architecture for a functional approach to reactive content. HTML-in-F# syntax inspired by WebSharper.UI and Fable. Alternatively, HTML templates with hot reloading provide a comfortable design experience. URL Routing the F# way, automatically matching URLs with F# union types. Easy Remoting with an ASP.NET Core server side. F#-specific optimizations: Bolero strips F# metadata from compiled assemblies, reducing the download size of the application. You can develop Bolero applications on Windows, OSX or Linux. It only has one prerequisite: the .NET Core SDK, version 2.1 or newer. The solution you just created comprises two projects. src/HelloWorld.Client is the project that gets compiled to WebAssembly, and contains your client-side code. Main.fs contains the main body of the page. This is where the meat of the application is: as you develop, you will mostly be coding here and in new files referenced from here. wwwroot/ contains static content. In particular, index.html is the actual page that is served. It contains a script reference to blazor.webassembly.js, which in turn loads your application. If you want to add styles and images to your application, this is the folder to put them. Startup.fs sets up Blazor to get the application started. You will rarely need to touch it: essentially only to set up remoting, if you want to use it. src/HelloWorld.Server is an ASP.NET Core application that serves as the host. This project is optional: if you pass --server=false when creating the solution with dotnet new, then it will not be created. Note however that it is necessary for templating hot reloading and remoting. Startup.fs, similarly to its client counterpart, sets up ASP.NET Core to get the server started.